Make room in your closets, there’s a new brand on the block. 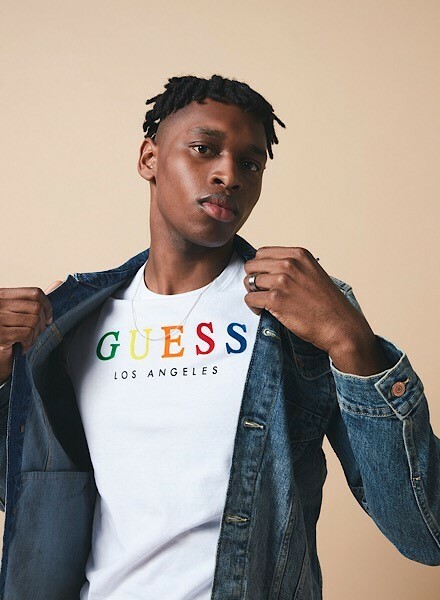 With GUESS dropping fresh lines to JD on the reg, there’s no saying no to these premium looks. Landing with collections for guys and the gals, you don’t wanna miss these style essentials. Founded in California back in 1981, brothers Maurice and Paul Marciano revolutionised Jeans as we know them. The iconic triangle logo was designed to symbolise young, adventurous lifestyle and before long, the brand had spread across North America, Europe and Asia. In recent years, GUESS has rebranded and is seen nearly everywhere. 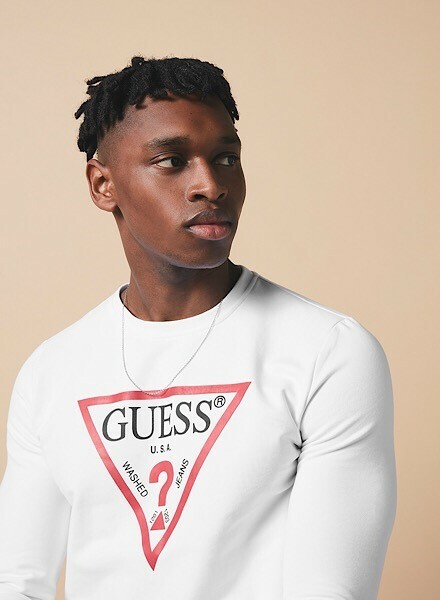 With collabs with names including A$AP Rocky, GUESS has been famously repped by the likes of Jennifer Lopez, Kylie Jenner, Frank Ocean and Don Benjamine to name few. 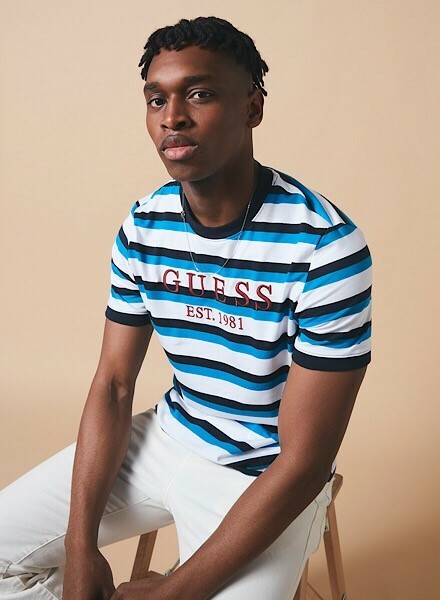 Hitting back with their latest 90’s revival, this collection comes to JD as a fresh, exciting new launch combining luxury designs with accessible street style. With pieces for every mood, our collection of women’s GUESS gets you lounging out in premium style. Refreshing your sofa essentials, this women’s Icon Crew Sweatshirt is perfect for keeping things comf’. Layered up with the Icon Crop T-Shirt, you can vibe out in premium style! Beach Ready? These Tape Bikini Bottoms keep things slick when you hit poolside with a high waist cut for a flattering fit. Fancy something more casual? This Icon Swimsuit gets you makin’ waves when you hit the beach AND is available in three hot colourways! Upgrading your fitness faves, this women’s Logo Bra combines luxury looks with supreme snugness. Paired up with these women’s Logo Leggings, your ‘fit will be ready to rep whether you’re hitting the streets or the sofa! Cop some serious drip to add to your street garms with this men’s Denim Jacket. Layered up with this Rainbow T-Shirt that’s available in three statement colourways, you’ll have your look on lock and ready for the streets. This Logo Stripe T-Shirt brings a standout element to your off-duty essentials. Landing in three bold colourway including blue, yellow and khaki, these tees brings a bold pop of colour to finish off your ‘fits. Ready for anything, this men’s Core Triangle Sweatshirt brings an iconic look to any sitch. Whether you’re steppin’ to the streets or smartening up your everyday essentials, keep your cuts lookin’ clean. Heading out out? This men’s Surf All Over Print Shirt gets you reppin’ a statement look from the weekend BBQs to the next lads hol! 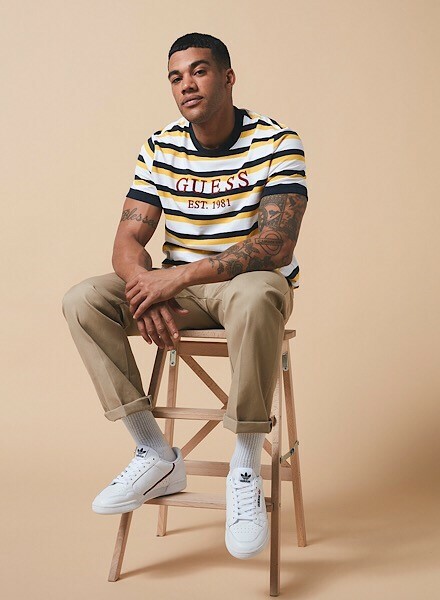 With fresh drops landing from GUESS on the daily, check out our entire men’s and women’s collections for stepped-up freshness every time.